The Amazon rainforest (Portuguese: Floresta Amazônica or Amazônia; Spanish: Selva Amazónica, Amazonía or usually Amazonia; French: Forêt amazonienne; Dutch: Amazoneregenwoud), also known in English as Amazonia or the Amazon Jungle, is a moist broadleaf forest that covers most of the Amazon basin of South America. 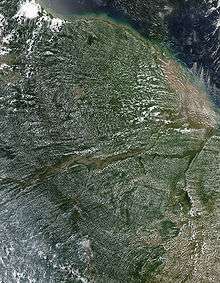 This basin encompasses 7,000,000 square kilometres (2,700,000 sq mi), of which 5,500,000 square kilometres (2,100,000 sq mi) are covered by the rainforest. 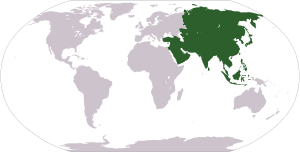 This region includes territory belonging to nine nations. The majority of the forest is contained within Brazil, with 60% of the rainforest, followed by Peru with 13%, Colombia with 10%, and with minor amounts in Venezuela, Ecuador, Bolivia, Guyana, Suriname and French Guiana. States or departments in four nations contain "Amazonas" in their names. The Amazon represents over half of the planet's remaining rainforests, and comprises the largest and most biodiverse tract of tropical rainforest in the world, with an estimated 390 billion individual trees divided into 16,000 species. CALIPSO uses a laser range finder to scan the Earth's atmosphere for the vertical distribution of dust and other aerosols. CALIPSO regularly tracks the Sahara-Amazon dust plume. CALIPSO has measured variations in the dust amounts transported— an 86 percent drop between the highest amount of dust transported in 2007 and the lowest in 2011. For a long time, it was thought that the Amazon rainforest was only ever sparsely populated, as it was impossible to sustain a large population through agriculture given the poor soil. Archeologist Betty Meggers was a prominent proponent of this idea, as described in her book Amazonia: Man and Culture in a Counterfeit Paradise. She claimed that a population density of 0.2 inhabitants per square kilometre (0.52/sq mi) is the maximum that can be sustained in the rainforest through hunting, with agriculture needed to host a larger population. However, recent anthropological findings have suggested that the region was actually densely populated. Some 5 million people may have lived in the Amazon region in AD 1500, divided between dense coastal settlements, such as that at Marajó, and inland dwellers. By 1900 the population had fallen to 1 million and by the early 1980s it was less than 200,000. 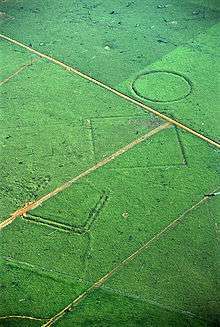 Since the 1970s, numerous geoglyphs have been discovered on deforested land dating between AD 1–1250, furthering claims about Pre-Columbian civilizations. Ondemar Dias is accredited with first discovering the geoglyphs in 1977 and Alceu Ranzi with furthering their discovery after flying over Acre. 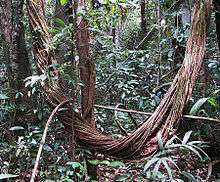 The BBC's Unnatural Histories presented evidence that the Amazon rainforest, rather than being a pristine wilderness, has been shaped by man for at least 11,000 years through practices such as forest gardening and terra preta. Terra preta is found over large areas in the Amazon forest; and is now widely accepted as a product of indigenous soil management. The development of this fertile soil allowed agriculture and silviculture in the previously hostile environment; meaning that large portions of the Amazon rainforest are probably the result of centuries of human management, rather than naturally occurring as has previously been supposed. 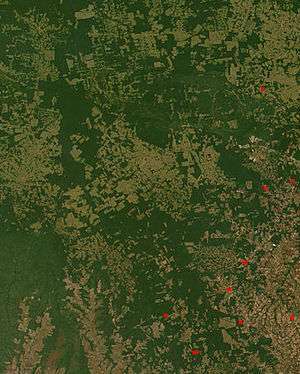 In the region of the Xingu tribe, remains of some of these large settlements in the middle of the Amazon forest were found in 2003 by Michael Heckenberger and colleagues of the University of Florida. Among those were evidence of roads, bridges and large plazas. The region is home to about 2.5 million insect species, tens of thousands of plants, and some 2,000 birds and mammals. 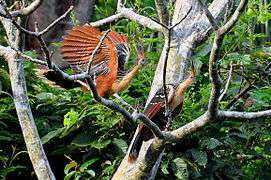 To date, at least 40,000 plant species, 2,200 fishes, 1,294 birds, 427 mammals, 428 amphibians, and 378 reptiles have been scientifically classified in the region. 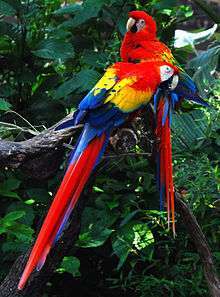 One in five of all the bird species in the world live in the rainforests of the Amazon, and one in five of the fish species live in Amazonian rivers and streams. 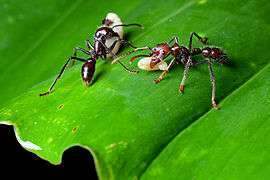 Scientists have described between 96,660 and 128,843 invertebrate species in Brazil alone. In the 1970s construction began on the Trans-Amazonian highway. This highway represented a major threat to the Amazon rainforest. Fortunately for the rainforest, the highway has not been completed, hereby reducing the environmental damage. Between 1991 and 2000, the total area of forest lost in the Amazon rose from 415,000 to 587,000 square kilometres (160,000 to 227,000 sq mi), with most of the lost forest becoming pasture for cattle. Seventy percent of formerly forested land in the Amazon, and 91% of land deforested since 1970, is used for livestock pasture. Currently, Brazil is the second-largest global producer of soybeans after the United States. 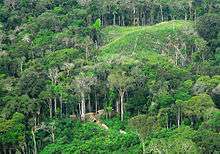 New research however, conducted by Leydimere Oliveira et al., has shown that the more rainforest is logged in the Amazon, the less precipitation reaches the area and so the lower the yield per hectare becomes. So despite the popular perception, there has been no economical advantage for Brazil from logging rainforest zones and converting these to pastoral fields. 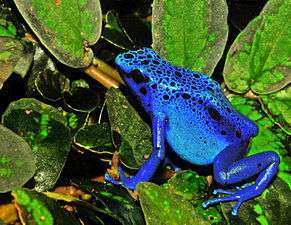 Environmentalists are concerned about loss of biodiversity that will result from destruction of the forest, and also about the release of the carbon contained within the vegetation, which could accelerate global warming. 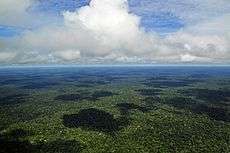 Amazonian evergreen forests account for about 10% of the world's terrestrial primary productivity and 10% of the carbon stores in ecosystems—of the order of 1.1 × 1011 metric tonnes of carbon. Amazonian forests are estimated to have accumulated 0.62 ± 0.37 tons of carbon per hectare per year between 1975 and 1996. To accurately map the Amazon's biomass and subsequent carbon related emissions, the classification of tree growth stages within different parts of the forest is crucial. 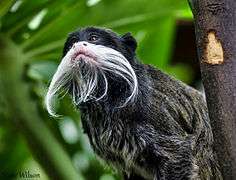 In 2006 Tatiana Kuplich organized the trees of the Amazon into four categories: (1) mature forest, (2) regenerating forest [less than three years], (3) regenerating forest [between three and five years of regrowth], and (4) regenerating forest [eleven to eighteen years of continued development]. 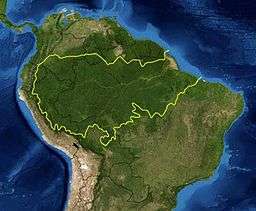 The researcher used a combination of Synthetic aperture radar (SAR) and Thematic Mapper (TM) to accurately place the different portions of the Amazon into one of the four classifications. In 2005, parts of the Amazon basin experienced the worst drought in one hundred years, and there were indications that 2006 could have been a second successive year of drought. A July 23, 2006 article in the UK newspaper The Independent reported Woods Hole Research Center results showing that the forest in its present form could survive only three years of drought. Scientists at the Brazilian National Institute of Amazonian Research argue in the article that this drought response, coupled with the effects of deforestation on regional climate, are pushing the rainforest towards a "tipping point" where it would irreversibly start to die. It concludes that the forest is on the brink of being turned into savanna or desert, with catastrophic consequences for the world's climate. In 2010 the Amazon rainforest experienced another severe drought, in some ways more extreme than the 2005 drought. 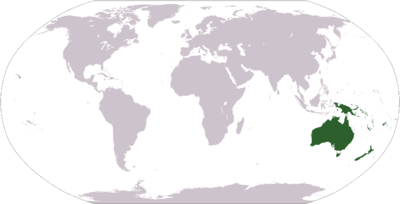 The affected region was approximate 1,160,000 square miles (3,000,000 km2) of rainforest, compared to 734,000 square miles (1,900,000 km2) in 2005. The 2010 drought had three epicenters where vegetation died off, whereas in 2005 the drought was focused on the southwestern part. 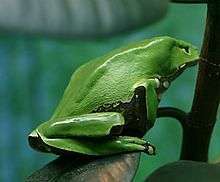 The findings were published in the journal Science. 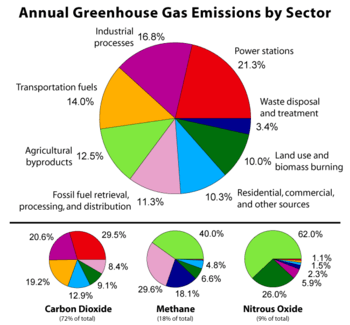 In a typical year the Amazon absorbs 1.5 gigatons of carbon dioxide; during 2005 instead 5 gigatons were released and in 2010 8 gigatons were released. ↑ "WNF: Places: Amazon". Retrieved 4 June 2016. 1 2 "Field Museum scientists estimate 16,000 tree species in the Amazon". Field Museum. 17 October 2013. Retrieved 18 October 2013. 1 2 Taylor, Isaac (1898). Names and Their Histories: A Handbook of Historical Geography and Topographical Nomenclature. London: Rivingtons. ISBN 0-559-29668-1. Retrieved October 12, 2008. ↑ Burnham, Robyn J.; Johnson, Kirk R. (2004). 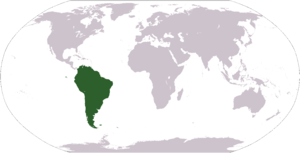 "South American palaeobotany and the origins of neotropical rainforests". Philosophical Transactions of the Royal Society. 359 (1450): 1595–1610. doi:10.1098/rstb.2004.1531. PMC 1693437 . PMID 15519975. ↑ Maslin, Mark; Malhi, Yadvinder; Phillips, Oliver; Cowling, Sharon (2005). "New views on an old forest: assessing the longevity, resilience and future of the Amazon rainforest" (PDF). Transactions of the Institute of British Geographers. 30 (4): 477–499. doi:10.1111/j.1475-5661.2005.00181.x. Archived (PDF) from the original on October 1, 2008. Retrieved September 25, 2008. ↑ Costa, João Batista Sena; Bemerguy, Ruth Léa; Hasui, Yociteru; Borges, Maurício da Silva (2001). 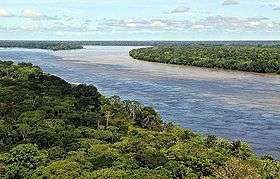 "Tectonics and paleogeography along the Amazon river". Journal of South American Earth Sciences. 14 (4): 335–347. Bibcode:2001JSAES..14..335C. doi:10.1016/S0895-9811(01)00025-6. ↑ Milani, Edison José; Zalán, Pedro Victor (1999). "An outline of the geology and petroleum systems of the Paleozoic interior basins of South America" (PDF). Episodes. 22 (3): 199–205. Archived (PDF) from the original on October 1, 2008. Retrieved September 25, 2008. ↑ Colinvaux, P. A.; De Oliveira, P. E.; Bush, M. B. (January 2000). "Amazonian and neotropical plant communities on glacial time-scales: The failure of the aridity and refuge hypotheses". Quaternary Science Reviews. 19 (1–5): 141–169. Bibcode:2000QSRv...19..141C. doi:10.1016/S0277-3791(99)00059-1. ↑ Koren, Ilan; et al. (2006). "The Bodélé depression: a single spot in the Sahara that provides most of the mineral dust to the Amazon forest (abstract)". Environmental Research Letters. Institute of Physics and IOP Publishing Limited. 1 (1): 014005. Bibcode:2006ERL.....1a4005K. doi:10.1088/1748-9326/1/1/014005. Retrieved 2007-01-01. ↑ Meggers, Betty J. (December 19, 2003). "Revisiting Amazonia Circa 1492". Science. 302 (5653): 2067–2070. doi:10.1126/science.302.5653.2067b. PMID 14684803. 1 2 Chris C. Park (2003). Tropical Rainforests. Routledge. p. 108. 1 2 3 "Unnatural Histories – Amazon". BBC Four. ↑ Martti Pärssinen; Denise Schaan; Alceu Ranzi (2009). "Pre-Columbian geometric earthworks in the upper Purús: a complex society in western Amazonia". Antiquity. 83 (322): 1084–1095. ↑ "Amazon Rainforest, Amazon Plants, Amazon River Animals". World Wide Fund for Nature. Archived from the original on May 17, 2008. Retrieved May 6, 2008. 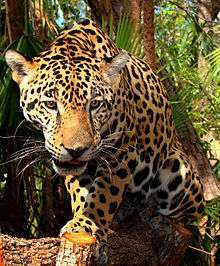 ↑ "Photos / Pictures of the Amazon Rainforest". Travel.mongabay.com. Archived from the original on December 17, 2008. Retrieved December 18, 2008. ↑ James S. Albert; Roberto E. Reis (March 8, 2011). Historical Biogeography of Neotropical Freshwater Fishes. University of California Press. p. 308. Archived from the original on June 30, 2011. Retrieved June 28, 2011. ↑ Da Silva; Jose Maria Cardoso; et al. (2005). "The Fate of the Amazonian Areas of Endemism". Conservation Biology. 19 (3): 689–694. doi:10.1111/j.1523-1739.2005.00705.x. ↑ "Amazon Rainforest". South AmericaTravel Guide. Archived from the original on August 12, 2008. Retrieved August 19, 2008. ↑ Mynenia, Ranga B.; et al. (March 13, 2007). "Large seasonal swings in leaf area of Amazon rainforests". Proceedings of the National Academy of Sciences. 104 (12): 4820–4823. Bibcode:2007PNAS..104.4820M. doi:10.1073/pnas.0611338104. PMC 1820882 . PMID 17360360. ↑ Staff (July 2, 2007). "Piranha 'less deadly than feared'". BBC News. Archived from the original on July 7, 2007. Retrieved July 2, 2007. ↑ da Rosa; Elizabeth S. T.; et al. (August 2006). "Bat-transmitted Human Rabies Outbreaks, Brazilian Amazon" (PDF). Emerging Infectious Diseases. 12 (8): 1197–1202. doi:10.3201/eid1708.050929. PMC 3291204 . PMID 16965697. Archived (PDF) from the original on October 29, 2008. Retrieved October 11, 2008. ↑ Various (2001). Bierregaard, Richard; Gascon, Claude; Lovejoy, Thomas E.; Mesquita, Rita, eds. Lessons from Amazonia: The Ecology and Conservation of a Fragmented Forest. Yale University Press. ISBN 0-300-08483-8. ↑ Kirby, Kathryn R.; Laurance, William F.; Albernaz, Ana K.; Schroth, Götz; Fearnside, Philip M.; Bergen, Scott; M. Venticinque, Eduardo; Costa, Carlos da (2006). 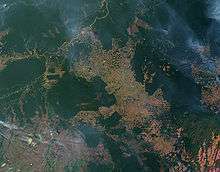 "The future of deforestation in the Brazilian Amazon". Futures. 38 (4): 432–453. doi:10.1016/j.futures.2005.07.011. ↑ Williams, M. (2006). Deforesting the Earth: From Prehistory to Global Crisis (Abridged ed.). Chicago, IL: The University of Chicago Press. ISBN 0-226-89947-0. ↑ Steinfeld, Henning; Gerber, Pierre; Wassenaar, T. D.; Castel, Vincent (2006). Livestock's Long Shadow: Environmental Issues and Options. 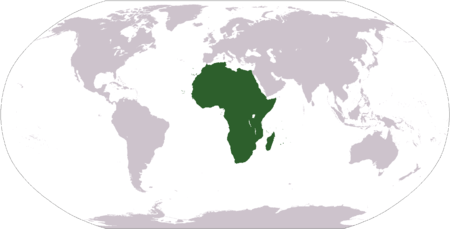 Food and Agriculture Organization of the United Nations. ISBN 92-5-105571-8. Archived from the original on July 26, 2008. Retrieved August 19, 2008. ↑ Margulis, Sergio (2004). Causes of Deforestation of the Brazilian Amazon (PDF). World Bank Working Paper No. 22. Washington D.C.: The World Bank. ISBN 0-8213-5691-7. Archived (PDF) from the original on September 10, 2008. Retrieved September 4, 2008. ↑ Melillo, J. M.; McGuire, A. D.; Kicklighter, D. W.; Moore III, B.; Vörösmarty, C. J.; Schloss, A. L. (May 20, 1993). "Global climate change and terrestrial net primary production". Nature. 363 (6426): 234–240. Bibcode:1993Natur.363..234M. doi:10.1038/363234a0. 1 2 Tian, H.; Melillo, J.M. ; Kicklighter, D.W.; McGuire, A.D.; Helfrich III, J.; Moore III, B.; Vörösmarty, C.J. (July 2000). "Climatic and biotic controls on annual carbon storage in Amazonian ecosystems". Global Ecology and Biogeography. 9 (4): 315–335. doi:10.1046/j.1365-2699.2000.00198.x. ↑ Houghton, J.T. et al. 2001. "Climate Change 2001: The Scientific Basis". Intergovernmental Panel on Climate Change. ↑ Peters, C.M. ; Gentry, A. H.; Mendelsohn, R. O. (1989). "Valuation of an Amazonian forest". Nature. 339 (6227): 656–657. Bibcode:1989Natur.339..655P. doi:10.1038/339655a0. ↑ Cormier, L. (April 16, 2006). 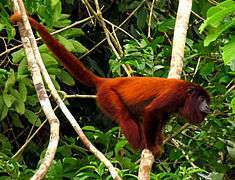 "A Preliminary Review of Neotropical Primates in the Subsistence and Symbolism of Indigenous Lowland South American Peoples". Ecological and Environmental Anthropology. 2 (1): 14–32. Retrieved September 4, 2008. ↑ David Adam. "Amazon could shrink by 85% due to climate change, scientists say". the Guardian. ↑ Wynne, R. H.; Joseph, K. A.; Browder, J. O.; Summers, P. M. (2007). "A Preliminary Review of Neotropical Primates in the Subsistence and Symbolism of Indigenous Lowland South American Peoples". International Journal of Remote Sensing. 28: 1299–1315. Bibcode:2007IJRS...28.1299W. doi:10.1080/01431160600928609. Retrieved September 4, 2008. ↑ Asner, Gregory P.; Knapp, David E.; Cooper, Amanda N.; Bustamante, Mercedes M.C. ; Olander, Lydia P. (June 2005). "Ecosystem Structure throughout the Brazilian Amazon from Landsat Observations and Automated Spectral Unmixing". Earth Interactions. 9 (1): 1–31. Bibcode:2005EaInt...9g...1A. doi:10.1175/EI134.1. ↑ Kuplich, Tatiana M. (October 2006). "Classifying regenerating forest stages in Amazônia using remotely sensed images and a neural network". Forest Ecology and Management. 234 (1–3): 1–9. doi:10.1016/j.foreco.2006.05.066. 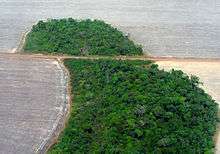 ↑ "Amazon rainforest 'could become a desert'", The Independent, July 23, 2006. Retrieved September 28, 2006. ↑ "Dying Forest: One year to save the Amazon", The Independent, July 23, 2006. Retrieved 23 August 2014. 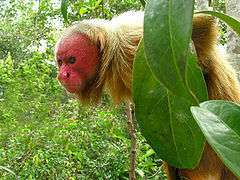 ↑ "Climate change a threat to Amazon rainforest, warns WWF", World Wide Fund for Nature, March 22, 2006. Retrieved 23 August 2014. Sheil, D.; Wunder, S. (2002). "The value of tropical forest to local communities: complications, caveats, and cautions". Conservation Ecology. 6 (2): 9.